This fall, the Tepper School of Business opened the doors to its new building on the Tepper Quad, strategically positioned and designed to maximize the interdisplinary educational paradigm at Carnegie Mellon University and provide a cutting-edge, forward-thinking curriculum to the business leaders of tomorrow. Since its inception almost 70 years ago, the business school at Carnegie Mellon University has grown significantly, from 16 master’s students in the Graduate School of Industrial Administration to hundreds of students across undergraduate, master’s, and doctoral programs at the Tepper School of Business. In that time, the model of business education has shifted, largely based on the management science model pioneered at Carnegie Mellon. 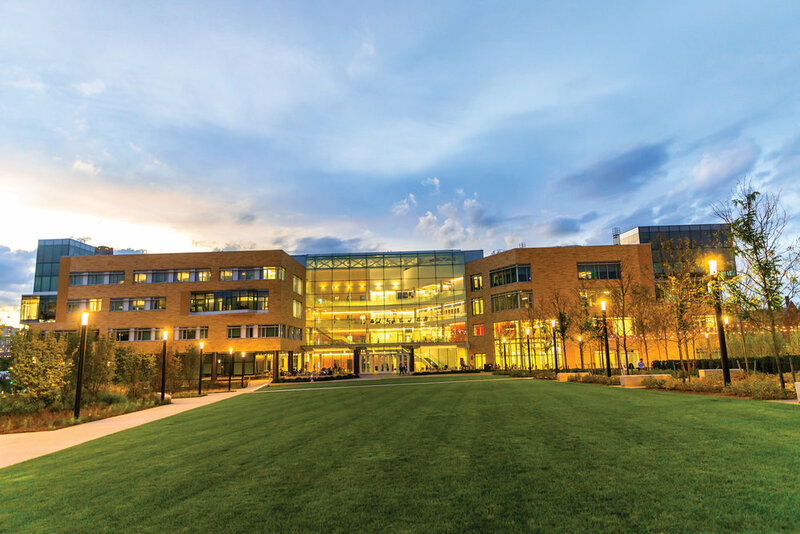 About 10 years ago, following several additions to its existing buildings, the Tepper School sought a new physical space that could accommodate its growing community — including an expanded Undergraduate Business Administration program and new master’s programs — and a new technology-enhanced, interdisciplinary approach to business curriculum. “We’re trying to build a space that can integrate a university,” David Tepper (MBA 1982) said. To do that, the Tepper School needed two things: a strategic vision and a building that enabled it to launch the Tepper School into the elite ranks as the business school of the future. David Tepper imagined a flexible building that “encourages entrepreneurial juices to flow” in ways they can’t in a traditional academic building. “Osmosis is a pretty powerful thing,” he said, emphasizing how valuable it can be when people simply spend time with one another. 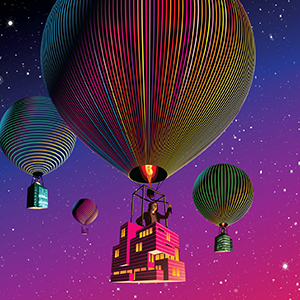 Tepper wanted students and faculty to mix, to learn from one another, to reach beyond the stratosphere of ingenuity. To achieve this vision, no ordinary building would do. Tepper likens the new building to the film “Field of Dreams,” pointing out that it draws people in by catering to the holistic needs of the learning community. The new building considers “the day-to-day essentials of living,” he said, like good food, the ability to move one’s body, and spaces to sit and work and — above all — talk with whoever happens by. When Dammon thinks about what the Tepper School needs to teach students into the future, he sees the business world headed toward the intersection of these concepts, which complement the renowned expertise of the faculty at the heart of the business school at Carnegie Mellon. “The needs of the new world of business are converging around the strengths of the Tepper School,” Dammon said. To build upon these strengths and excel, the Tepper School needed a different sort of space — a building that facilitates an interconnected campus and supports existing curricula with the flexibility to evolve. The resulting structure is five stories and 315,000 square feet constructed strategically in close proximity to both the Heinz College and the School of Computer Science with nearly 40 percent of the building’s space intentionally designed for non-business school purposes. 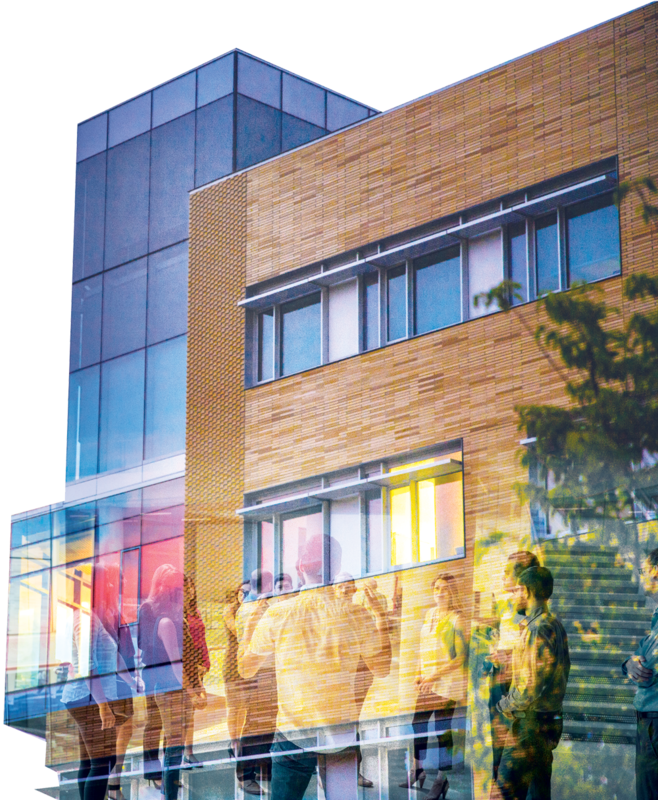 Rather than hide from the hustle and bustle of a thriving city and busy campus, the Tepper School’s new home lures it all inward, with spaces to learn, eat, exercise, and gather. For the first time, the undergraduate students of the Tepper School will have dedicated classroom space, study space, and social space comparable to that for the graduate students. The vast Rohr Commons achieves Tepper’s dream of serendipitous social interactions between people from different backgrounds and different programs on campus. He said, “I don’t think you’ll see another business school that’s quite set up like this.” At every stage, the vision for the building centered on bringing different threads of the university together, and this collaborative spirit sets the school apart from its peers. Dammon says the Tepper School’s strategic plan “can’t just be an arms race with other business schools. They all have new buildings. We believe this building helps facilitate the direction of our research and will help the Tepper School lead in the new era, driven by technology and innovation.” Carnegie Mellon is a relatively small university, but Dammon says the institutional emphasis on collaboration sets members of the CMU community apart as problem-solvers. “Most business schools are very insular,” he said, housing only business students and faculty. The Tepper School gathers students and faculty from all over campus, to focus on activity that is interdisciplinary and to ultimately solve society’s big problems. Swartz is confident that fostering entrepreneurship skills among students across all disciplines on campus will help keep Carnegie Mellon at the center of development for the city of Pittsburgh and for grand ideas not yet imagined. The new building includes designated space for startup incubators. The Swartz Center emphasizes this type of entrepreneurship in its educational model, teaching students, faculty, and other CMU community members how to take their research and innovative, disruptive ideas and turn them into real companies that solves society’s real problems. Dave Mawhinney, Associate Teaching Professor of Entrepreneurship, Executive Director of the Swartz Center for Entrepreneurship, says the value of a Tepper School education, in part, is access to the great innovations in engineering, design, and science that are taking place all across CMU’s campus. “We’re the business school that applies science and engineering principles to business,” he said. 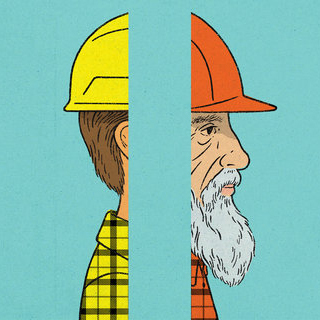 “That’s what differentiated us throughout the ’70s and beyond. That never went away, and this building gives us the opportunity to maintain that differentiation.” Mawhinney says the Tepper School will always remain a rigorous, demanding, efficient, and productive business school creating great CEOs, but the Swartz Center and its new physical presence allows CMU to foster entrepreneurship through programming and events that are accessible to the entire university. Mawhinney explains that the new building’s location puts everyone within a five-minute walk of its inviting collaboration space. “Each company needs, at minimum, a hacker, a hustler, and a designer,” he said. Close proximity and a high-quality dining commons should help those groups of future entrepreneurs find each other more easily. While Carnegie Mellon has largely been successful in attracting investors for its startup companies, Mawhinney feels the university has been humble about its prowess in the global economy. He’s working with, for instance, faculty from the chemistry department who have figured out how to plate aluminum onto steel in water, without hazardous cadmium and chromium, which are outlawed in the European Union. Developing prototypes and business plans for these ideas is the daily work of the Swartz Center. Laurie Weingart, Interim Provost for Carnegie Mellon University, Richard M. and Margaret S. Cyert Professor of Organization Behavior and Theory, recognizes how the new building’s design and space match up perfectly to the philosophy embedded in its original plan. The university itself, as well as the Tepper School, were founded as places where professors can teach and students can learn across disciplines, and explore different approaches to their work. “Both the old Tepper building and the new one intersperse faculty between academic areas,” explained Weingart, whose research interests and expertise lie in organizational behavior in interdisciplinary themes. “There’s no finance wing, for example, or a floor dedicated solely to economics. What we uniquely do here is allow students and faculty to work through traditional academic boundaries to produce work that makes an impact in our world.” Weingart views the Tepper School’s move to the center of campus as an opportunity for all students and faculty to connect more closely with one another. In her own research studying negotiation, conflict, and innovation in interdisciplinary teams, she has seen that collaboration between disciplines is not just helpful, but often essential. For example, her recent research explores interprofessional teams in intensive care units in the hospital setting, where team dynamics directly impact the quality of care given to critically ill patients. Through her scholarly work, Weingart has observed how interdisciplinary collaboration can pave the way for successful outcomes in any setting, and encourages Tepper School faculty and administration to foster a culture of collaboration for its students. This encouragement is not confined within the walls of the Tepper School. Weingart works to ensure that interdisciplinary study is offered between Carnegie Mellon colleges as seamlessly as possible. “There isn’t room for purists,” said Andrew Moore, Dean of the School of Computer Science. While SCS students and faculty have been leaders of the tech world, Moore recognizes that “it is no longer the case in the tech industry that you are either a computer science person or a business person.” The Tepper School and SCS have teamed up to create a master’s degree in product management, a program that represents a blend of the skills in which the Tepper School and SCS each excel. The students learn how to both manage people and efficiently run processes, and feel comfortable troubleshooting a massive cloud database. “So many programs across campus are bursting,” Moore said, referring to physical lack of classroom space. “SCS can now expand some high-demand programs without constraint for availability of classroom space.” Additionally, faculty in both colleges often share appointments or teaching duties; the new building enables faculty to be closer to all of their students. Ramayya Krishnan, Dean of the Heinz College, is pleased about the Tepper School’s move from the borders to the nucleus of campus. He points out that SCS, Heinz, and the Tepper School have shared roots in founding faculty members and that all have focuses and expertise that complement the strengths of each other’s programs. Krishnan references a time in 1956, when an IBM 650 was installed in the basement of the Graduate School of Industrial Administration building. This single computer eventually grew into the School of Computer Science — making SCS a spinoff of the business school. The Heinz College is supported in part by PricewaterhouseCoopers for a program that brings together students from both the Tepper School and public policy programs to examine how the digital transformation is changing the nature of regulatory compliance. Krishnan says businesses are increasingly asked to comply with regulations, and his students have a deep understanding of the technology used in this compliance. Together, they ponder best practices and cost efficiency, tackling the problem via a multidisciplinary learning experience. Dammon believes that a new facility with wide open, ample physical space to collaborate will be invaluable for CMU, and he is eager to bring industry partners to the new space. Krishnan points out that the massive ground-floor Rohr Commons will become the proverbial water cooler. “Students and faculty will congregate around food,” he said, “and there will be lots of interesting intellectual collisions.” This is an intentional aspect of the Tepper Quad that Krishnan feels will drive innovation and interdisciplinary connections. But the new building on the Tepper Quad does more than just move the business school to the middle of campus. Key design aspects set the $201 million construction project apart from the buildings of business school peers. “Look for the curtain of glass as you walk toward Morewood. You can’t miss it.” Bryan Routledge, Associate Professor of Finance, knows that people visiting his new office aren’t quite accustomed to crossing Forbes Avenue, but he’s also certain the five-story building is unmistakable. “It’s like a beacon, pulling students in.” The narrow yellow bricks constructing its shell pay a very deliberate homage to the yellow brick of Baker and Porter halls, Hamerschlag Hall, and Doherty Hall — original Carnegie Technical Schools buildings designed by Henry Hornbostel — but the glass atrium is another thing entirely. Through the windows, pedestrians can see people cross bridges linking different areas inside, winding their way up and down the grand staircases overlooking the heart of Oakland. Routledge fell into his role on the design team for the new space back in 2012, when the university first decided to install this modern, evocative, intellectual paradise on what was formerly part of the Morewood parking lot. To make this vision a reality, everyone involved needed to stretch their skills. Routledge partnered with the Pennsylvania Department of Transportation to revamp Forbes Avenue now that CMU has brought an academic building to the north side of the road. He became familiar with Complete Streets concepts, an approach to designing roadways and rights of way with all users in mind. Imagining the collaborative and cooperative use of space around the building meant deliberately planning landscaping, relocating sidewalks, and installing new smart spotlights — all part of the work when designing a building that is equal parts strategic vision and physical structure. The design team spent years considering every aspect of the construction to meet the university’s vision of an interconnected campus. “The idea behind this new building is not coming together to collaborate so much as it’s living together in a rich, knitted fabric.” Routledge said. Central to the vision is Rohr Commons food court, complete with couches and crannies for conversations and study groups, representing a mixing bowl of the entire campus. Routledge envisions business students mingling with roboticists and data analysts, sharing challenges with one another and realizing they can collaborate to form solutions. When describing the planning process for the Tepper Quad, Routledge said the small working group had frequent, inclusive meetings. The team built consensus slowly, across years, to agree on the purpose and function of each area in the design. The design group agreed that the most important thing was the atrium. It was an expensive decision, because such a space can’t be programmed and isn’t owned by a specific department, but the mixing bowl was crucial to the chance meetings Dammon anticipates as the school evolves and the osmosis David Tepper values so highly. “People coming here and creating connections: That’s what this is all about,” Routledge said. The design of the Tepper Quad also mirrors the vision and purpose it’s meant to serve. Everything from re-imagined corners of rooms reshaped from wasted to usable space to the placement of wiring and plumbing was carefully considered in creating the building as a vessel of creativity, collaboration, and innovation. Utkarsh Ghildyal, principal project manager on the Tepper Quad project, found that some aspects of the CMU master plan regulations presented a hurdle for the Tepper Quad to achieve its goals. Campus rules mandate new construction be no taller than 75 feet. However, a traditional steel structure requires 83 feet to reach five stories. In order to accommodate the planned programming in the building and comply with regulations, the design team had to do what Tepper School students and faculty do best: innovate. The team selected a construction method called biaxial hollow deck slab system, or “BubbleDeck,” that reduces the amount of concrete and steel required for large buildings. The Tepper Quad building, currently the largest BubbleDeck structure in North America, involves placing hollow plastic balls — made from surplus plastic from kayak manufacturing — within a steel rebar structure. The bubbles displace 25 percent of concrete volume, resulting in a lighter, thinner slab. Roughly 270,000 square feet of BubbleDeck slabs were poured over nearly 220,000 plastic bubbles to create floors two through five. These lighter slabs result in a lighter building requiring fewer concrete support pillars, giving the design team the required eight feet of space forgiveness to meet their vision and follow the master plan requirements. The university is anticipating a Gold certification from Leadership in Energy and Environmental Design as a result of these innovative, forward-thinking solutions. Buzz Yudell, founder of Moore Ruble Yudell Architects and Planners, was lead architect for the project. He describes the new building as a collection of different kinds of spaces. He knew that flexibility of physical space and facilitating meaningful interactions were crucial. The Tepper School wanted connectedness happening in every aspect of the space. Every staircase offers places to meet and jot notes, while each terrace can be used for events or seminars. “There is no corridor that is just a corridor,” Yudell said. “There is no single square foot of the building that isn’t used in some way.” Hallways feature soft seating, café tables, and spaces to talk or take notes. Strategic islands throughout the halls allow for events to access audio/visual technology or space to serve food, display materials, or store supplies. Raised floor construction on the second and third floors means that data and electricity, and even air delivery, are fed below, with a grid of access points. Instructors can easily lay out a room in radically different configurations for teaching and study. Inherent in the flexible design is the knowledge that education will look different in 10 years. As teaching pedagogy evolves, the new Tepper Quad must adapt to accommodate that. Marsha Lovett, Director of the Eberly Center for Teaching Excellence and Education Innovation, even points to the ceilings in some classrooms. There, instructors can access technology that helps them analyze their teaching practice, gathering data on everything from student movement to facial affect. Learning scientists in the Eberly Center can help Tepper School faculty study not just the content they’re delivering, but its effectiveness in improving student outcomes. From the beginning of the design concept, the Eberly Center was planned to share space in the Tepper Quad, a proximity that makes collaboration seamless. Such partnerships help usher the Tepper School into the future of business education as learning strategies shift at a blinding pace. Lovett and her colleagues consult with faculty on how room layout and furniture arrangement can help enhance teaching strategies, making data-informed decisions as Tepper School faculty help educate the business leaders of the future inside the technology-enhanced, flexible building making this vision possible. Technology in the classrooms allows students who are not in Pittsburgh to fully participate in discussions in real time. Lovett explains that all classroom spaces in the new Tepper building encourage collaborative configurations. Some rooms are tiered, so instructors can lecture, but every other row of seats can turn around to facilitate small group work in the same space. Other rooms have sliding walls of glass to open and join classrooms into formal spaces or informal breakout spaces. Graduate and undergraduate areas of the building have innovation labs that are physically flexible, with moving walls and furniture. “As we move into the future of education, we have to be ready for things to look rather different from how we have taught or how we are teaching now,” Lovett said. Tepper School faculty and students are ready to face those changes together thanks to the strategic choices made in building their new home. As the masses of students filled the modern water cooler of Rohr Commons, they entered a beautiful new building that, whether they realized it or not, prioritized learning and innovation in every element from furniture layout to the placement of electrical lines. David Tepper’s vision for the business school of the future has finally opened its doors. Shaping Teaching Practice Through Data and Smart Tech. . .
Every year, Marsha Lovett and her colleagues at the Eberly Center for Teaching Excellence and Educational Innovation support one in four faculty members teaching at Carnegie Mellon University. Lovett and her team specialize in teaching strategies, learning science, and the ways technology can improve students’ learning. For instance, when the Tepper School developed the online hybrid MBA delivery format, leadership consulted with the Eberly Center to build the most effective teaching strategies using the most effective technology for online modules, as well as to shape the in-person meetings bookending each semester. Using data to make informed decisions, Lovett guides faculty to evaluate what works and what can change to make sure faculty are using their teaching time efficiently and that students are getting the most from their instruction. This year, the Eberly Center has the capability to stretch even further thanks to technology-enhanced classrooms in its new space at the Tepper Quad. All classrooms in the new Tepper Quad building benefitted from consultation with Lovett throughout the design process. “Physical space is an agent in the teaching and learning system,” she said, noting that a classroom can either promote or inhibit certain activities. Stationary, stadium-style seating doesn’t leave much room for interactive teaching or group work. The new building’s classrooms have moveable walls, moveable furniture, and even portable electricity towers. Lovett guides faculty members through making the most of the features in their space, demonstrating how each room can accommodate lecture or small-group layouts where every student can easily see monitors, white boards, or presentations. “Faculty can now leverage furniture and audio/visual equipment to fit their teaching,” she said. Within the Eberly Center space, faculty seeking experience can conduct occasional classes or teach for an entire semester using special instrumented classrooms that collect data. Cameras and sensors throughout these special rooms monitor everything from student movement to facial affect to determine when students are engaged and when they’re fidgeting. The Eberly Center has access to technology to analyze the data and identify key markers to make sure educational experiments are working as intended. “Using data, we can create innovative educational experiences that are known to be effective as well,” Lovett said.